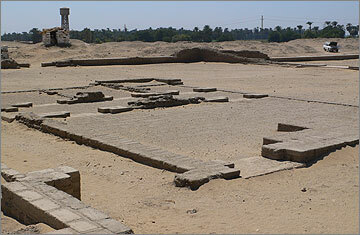 The name ‘Central City’ is a modern one given to a distinct zone of the city where the two principal temples to the Aten and the main state palace were situated, as well as numerous administrative buildings. It remains the only example of a royal centre to have been brought to light in ancient Egypt and was, for the short time of the Amarna Period, the centre of Egypt at the peak of its prosperity. This was where the scenes in the Northern Tombs were enacted, when the Royal Family swept in from the north, riding in their chariots and accompanied by their bodyguard, making for the temples depicted in such detail on the tomb walls. Its present appearance owes much to the fact that the most important parts were originally built from stone but, shortly after the Amarna Period had ended, the stonework was removed from the site, to be re-used in buildings elsewhere. We can, nonetheless, be confident in knowing the plans of the stone buildings because each had been built upon an artificial surface of gypsum. The gypsum retained impressions from the lowest course of stone blocks, and other marks related to the planning of the building, and large areas of this gypsum layer survived to modern times. 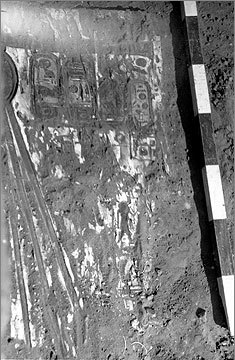 The Central City was completely excavated in the 1930s by the Egypt Exploration Society under the direction of John Pendlebury. 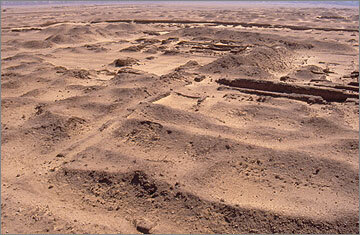 The larger of the two Aten temples was defined by a brick enclosure wall enclosing an area 800 x 300 metres. Much of the interior was left as flat open ground. It did contain, however, two stone buildings, one (the Long Temple) close to the front, the other (the Sanctuary) towards the rear. The Long Temple, often in the past called by an ancient name Gem-pa-Aten (though on weak grounds), measured c. 190 x 33 metres. It lay across the central long axis of the great enclosure, and behind a pair of brick pylons. An external portico of monumental columns fronted a progression of open courtyards, each separated by a monumental doorway based on the familiar pylon shape. The courts numbered six. Each was largely filled with stone offering-tables, to a total of at least 791. The reconstruction of the interior appearance depends to some extent upon use of the pictures of the Aten temples found on the walls of some of the rock tombs of the northern group. They point to the presence of three important centres of ritual interest and performance situated on the temple axis. The first, in the outer court, is a platform reached by steps. It was on this that Akhenaten, accompanied by his family, offered prayers and food-offerings to the Aten. The gypsum foundation layer has been lost at this point. The other two are a pair of tables of offerings, standing on legs (and so made of gold-covered wood? ), that seem to have stood on low stepped platforms in the rear two courts of the temple. The Long Temple had seen a degree of rebuilding and enlargement which had replaced an earlier set of offering-tables that had run for only a short distance behind the entrance in the main enclosure. Immediately outside the Long Temple, on the south side, a field of 920 mud-brick offering-tables had been laid out on a grid. 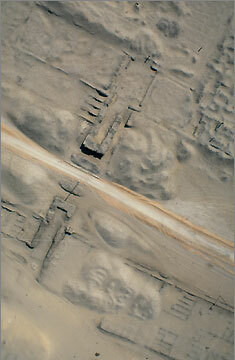 The excavators thought that an identical matching field had been laid out on the north side of the Long Temple as well. This is not properly substantiated, and much of the area has been lost to a modern cemetery. The Sanctuary lay towards the rear of the main enclosure. It was a rectangular stone building, 48 x 32 metres, subdivided by a stone pylon, the two portions open to the sky and filled with yet more offering-tables (perhaps over 150). It had replaced an initial layout that had included a plantation of trees in mud-filled tree pits, and a square base – either an altar or pedestal for a standing object – made of mud bricks. 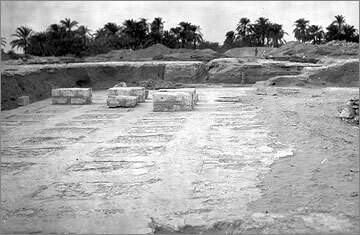 Excavation photograph (1932) of the rear part of the Sanctuary of the Great Aten Temple, viewed towards the east and showing the remains of the gypsum foundation layer. A square brick building that straddled the north enclosure wall and provided an elaborate though not impressive means of access. It was called the ‘House of Foreign Tribute’ by the excavators (relating it to scenes in tombs 1 and 2), though the identification does not work well. The very ruined building consisted of four separate suites of rooms provided with stone lustration slabs that were perhaps robing or purification rooms for people about to enter the temple enclosure (though whether priests or members of the royal family one cannot tell). A stone construction a short distance to the north of the point where the two axes crossed. 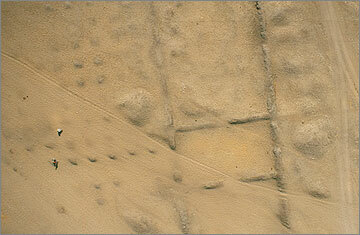 The foundations suggest a square pedestal or platform reached by a ramp. 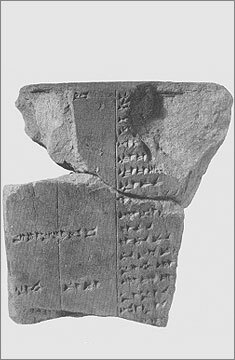 Many fragments from a purple quartzite stela inscribed with a list of offerings were found in the vicinity. It can be matched with pictures in some of the tombs showing a round-topped stela on a pedestal, accompanied by a seated statue of Akhenaten. A square enclosed by a brick wall, identified by the excavators as a slaughtering-court or butcher’s yard, another feature shown in the tomb pictures. Several elements in the temple layout, especially the extraordinary multiplication of offering-tables, imply that the temple was the centre of a major food cycle, serving temple dependants, perhaps amounting to a significant portion of the city’s population. 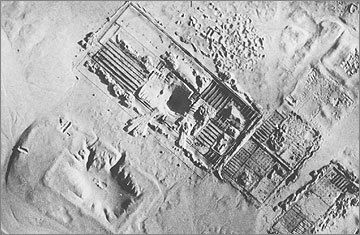 A re-examination of the Great Aten Temple began in 2012. See Recent Projects. 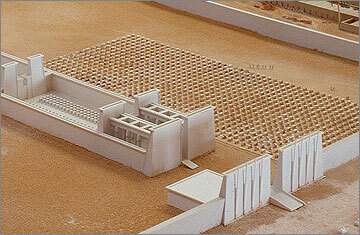 The house of the high priest (First servitor of the Aten) Panehsy (T41.1). This Panehsy is the same as the owner of rock tomb no. 6, and also of a large house in the Main City (R44.2). 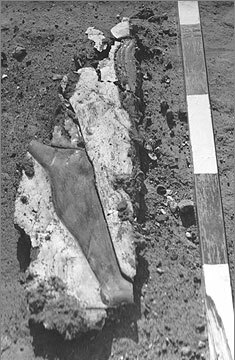 He also held the title ‘Superintendant of the cattle of the Aten’, and in keeping with this title the excavation of his house and surrounding ground yielded numerous bones and horn cores of cattle (confirmed by a sample excavation of the spoil heaps in 2006). 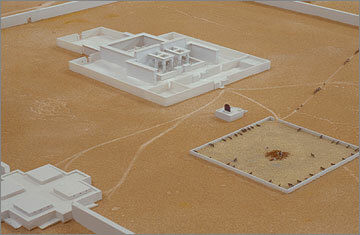 Panehsy’s house is the source of the well-known carved limestone shrine now on display in the Egyptian Museum, Cairo. A building (S40.1) containing several columned halls, paved with stone and provided with stone facing to the lower parts of the walls, stone troughs and ovens. The overall design, its location and the presence of ‘ox bones’ point to the likely use of the building as a place for the preparation of meat, although the excavators interpreted the building as ‘a purificatory area for the priests’. Three long rows of parallel chambers, many having ovens at the back. 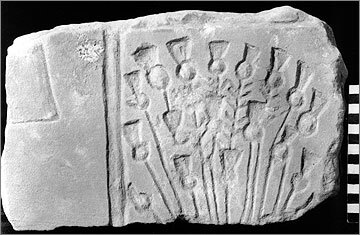 The presence beside them, over them and across a large area of the desert to the east of huge numbers of sherds from pottery bread moulds leaves little room for doubt that this was a bakery. By the New Kingdom bread baked in pottery moulds was largely reserved for use in temples and chapels. To the south the remainder of the ground was occupied by a complex of storerooms and other buildings. Amongst the material found is a notable concentration of large pottery jars bearing labels which identify the contents as meat, and an equally notable concentration of quern-stones, though where the latter were used is hard to identify. 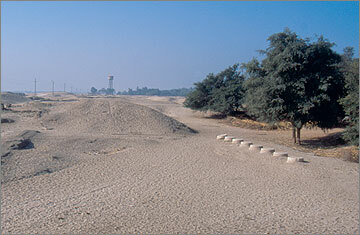 By the time that Amarna was abandoned the Great Palace (a modern name) extended for at least 580 metres along the west side of Royal Road and occupied the ground between it and the riverbank. A scene in the tomb of May (no. 14) shows what must be the river aspect of the palace: a long colonnade looking out over a foreshore with vegetation and boat equipment, beyond which are moored boats with their gangways resting on land. The palace is clearly orientated towards the north, but the place where the grand entrance is to be expected lies beneath the modern fields. Although reduced to fragments the evidence from the Great Palace points to a building on which an exceptional degree of care had been lavished. It is visible in the faience mouldings and tiles, the inlaid hieroglyphs carved from separate pieces of hard stone, the stelae and balustrades in alabaster, the inlaid and gilded columns in a variety of plant forms, the fragments of many statues in granite and quartzite. The walls of the mud-brick portions were painted with scenes, and the floors covered with painted gypsum pavements. The State Apartments, built of stone. The now lost grand entrance led into a courtyard measuring about 160 metres square. 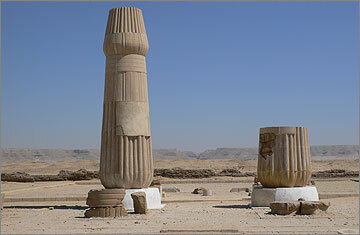 A row of statues of the royal family, many of them granite colossi of the king, ran along the east and west sides. The rear, facing side of the square was covered with a deep portico of columns which developed into a central projecting terrace four columns deep. Behind this came a series of rectangular courts and halls which perhaps terminated in a throne dais on the building’s axis. The central space contained a wide ramp ascending to a deep columned terrace that stood behind the portico that projected into the great court. One way of restoring this part is to make it into the principal Window of Appearance that is such a prominent feature in the rock tombs of officials, the place where they are rewarded by the king for their loyal service. The eastern apartments, built of mud brick. These formed a long narrow set of individual buildings that ran between the State Apartments and Royal Road, with a width of about 35 metres. The excavators recognised two main sections, the ‘Harem Quarter’ and the ‘Magazines’, divided by an east-west access route that led to the Bridge linking the Great Palace to the King’s House. The ‘Harem Quarter’ contained a northern part: a sunken garden flanked by a row of small chambers on each side, and a more formal columned area on the south that included a portico facing on to the garden. The pavements of this columned part were covered with gypsum plaster brightly painted with scenes from nature and with figures of bound foreign captives. At the very back of this part was probably a royal throne. The southern part consisted of a group of small rooms leading to an open portico facing a garden on the east side. A similar set of painted gypsum floors filled the rooms. The ‘Magazine’ part comprised four sets of narrow parallel chambers of the kind normally used for storage in ancient Egypt, some of them fitted with brick supports for shelves. The whole ensemble of the eastern apartments forms, in effect, a self-contained palace that could have accommodated the royal family. The chambers around the sunken garden could have been housing for servants who attended personally to the royal family. 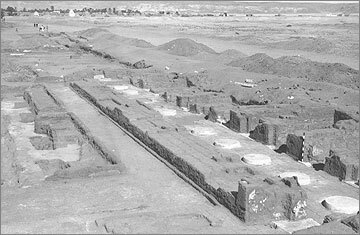 Excavation photograph (1934) of the sunken garden of the northern section of the ‘Harem Quarter’ of the Great Palace, viewed to the north-east. The small chambers behind a columned portico are on the right. ‘Servants’ Quarters’. In reality a continuation northwards of the eastern apartments. 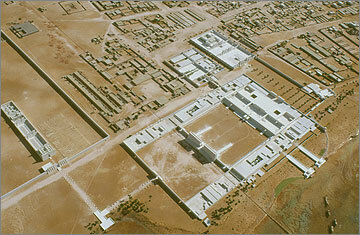 It contained a mixture of larger storerooms and small to medium-sized houses. They presumably provided accommodation for palace staff that were more distant from the royal family. Coronation Hall or Smenkhkara Hall. 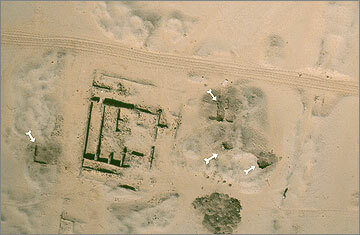 Added to the southern end of the Great Palace at the end of the Amarna Period, this rectangular building, 130 x 135 metres, is notable for the large number of brick piers (544 in the main central part). The destruction (prior to modern archaeological investigation) of the floors, and disturbance of the whole has left little additional evidence upon which to base an interpretation, apart from the plan itself. Petrie wrote of the best preserved part: ‘These pillars were white plastered, with a small torus-roll up the corners, and the ceiling was of mud plaster, painted with vine-leaves and bunches of grapes on a yellow ground.’ During a re-examination in 1935 stamped bricks bearing the cartouche Ankh-kheperura were found loose in the debris, as well as faience tiles that were thought to have lined its walls. Although it has been suggested (by C. and F. Traunecker) that it might have been a huge vineyard, the interpretation that it served as a banqueting hall still seems the most plausible. 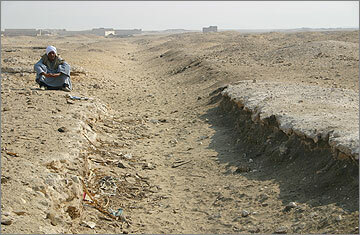 A pathway 9 metres wide linked the Great Palace to the King’s House, but not at ground level. Within both buildings a ramp began its ascent on the side facing Royal Road and, having risen many metres above it, was carried across on two massive brick piers. To prevent the supporting walls from cracking under the weight of the bridge, its timbers and upper work, many wooden beams were inserted into the brickwork. Some part of the bridge had born painted scenes on plastered walls, depicting the royal couple and a pond and garden. The excavators placed the Window of Appearance in the central part of the bridge, but this seems somewhat impractical, given that one of its main functions (to judge from the scenes in the rock tombs) was to enable the king to hand rewards in the form of valuable objects to his loyal officials. An open court planted with trees in rows that formed an avenue leading southwards from a pylon entrance. It was into this court that the bridge descended. A set of apartments of different sizes, some of them single-roomed. The main apartment building might have been of more than one storey. At its centre was a columned hall and beside it a smaller room containing a small stepped platform that resembles a throne dais. Part of the outside wall was painted, with a scene of foreign captive figures, raising the possibility that a lesser Window of Appearance was situated here. The interior walls of this building were painted with scenes, one of them showing Akhenaten and Nefertiti relaxing with their daughters. A substantial set of storerooms divided into two blocks, each of them containing paired rows of storerooms facing an enclosed court. Some contained short brick supports, as if for shelves. They could have been granaries, or could have stored a wider variety of commodities. The storerooms had replaced an earlier set of constructions to which perhaps belonged a series of tree pits. They were also the site of a cemetery of dogs buried probably in the last centuries BC. The purpose of the King’s House and its relationship to the Great Palace can only be guessed at. The placing of the bridge, and the broad entrance from Royal Road, gives considerable prominence to the courtyard and leaves the main apartments with relatively modest entrances. 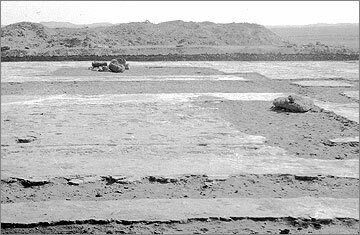 The smaller of the two Aten temples occupied a brick enclosure measuring 191 x 111 metres, its outside surfaces strengthened with regularly spaced buttresses. Many stamped bricks bear the name ‘The Mansion’, matching the name of one of the intended buildings listed in the Boundary Stelae, ‘The Mansion of the Aten’. It was subdivided into three courts, each one entered through a pair of thick brick pylons spaced to leave an unusually wide stone threshold that is unlikely to have been closed by doors. Each of the pylons was provided with two niches where wooden flagpoles would have stood, and the first and second pairs had small outer chambers that could have been the foundations for staircases rising through the thickness of the pylons. 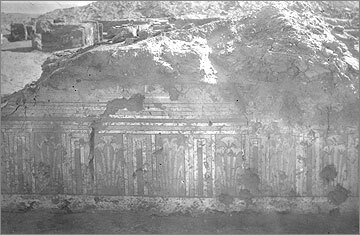 Excavation photograph (1931) of the front gateway of the Small Aten Temple, with offering-tables in front. 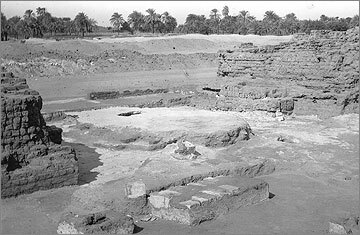 The first court contained the foundations for a large rectangular platform of mud brick reached by a staircase and flanked by 106 mud-brick offering-tables arranged in rows on either side. The central platform had been more thoroughly destroyed, perhaps a sign that it had been demolished during the life of the building. The second court, shorter than the others, contained a small house-like structure on the south side of the temple axis. It was provided with a very small mud-brick dais reached by steps, as if perhaps a throne base. 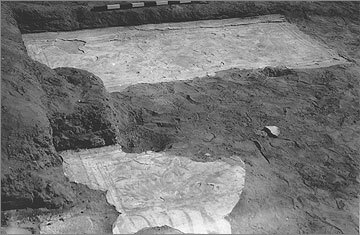 The excavators interpreted ‘traces of brick and plaster foundations’ in the middle of the court as the possible remains of a stela. The third court was dominated by the all-stone Sanctuary, very similar in design to that at the rear of the Great Aten Temple. It, too, had been filled with offering-tables. A double line of trees in tree-pits had surrounded the Sanctuary on three sides. A number of small brick buildings were dotted across the ground outside. 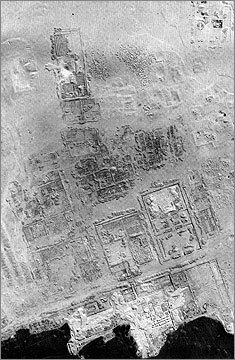 To the south of the temple lay a long street of rectangular buildings ending in an enclosure containing a well (unexcavated). Most of the space inside the buildings is occupied by parallel chambers. Some are likely to have been storerooms but many contained ovens at the back. 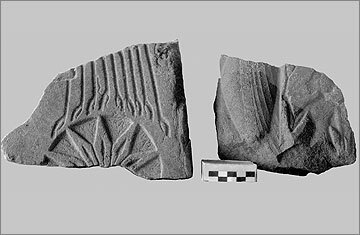 Sherds of pottery bread moulds show that festival-bread was baked here for the temple, but evidence has also been found to suggest that faience and glass objects were manufactured as well. 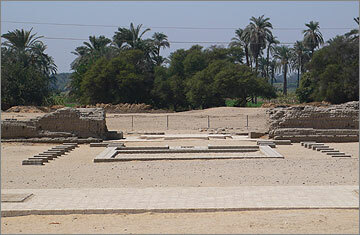 The ground behind the King’s House and the Small Aten temple was taken up with numerous mud-brick buildings arranged in rows separated by narrow streets. Those behind the King’s House seem to have been primarily for various kinds of scribal work. They included the ‘Bureau of Correspondence of Pharaoh’ (the term used on its stamped bricks), where most of the cuneiform tablets were found that are commonly known as the Amarna Letters. The greatest number are letters from a diplomatic correspondence between the Egyptian court of the reigns of Amenhetep III and Akhenaten and vassals and rulers of the Near East. Some, however, are literary texts and imply the existence of a place of study and learning. A building not far away in the next block was built from bricks, some of which bore the stamp ‘House of Life’, itself a term for a place of study. One rare find of papyrus fragments from here has revealed a papyrus scene of battle perhaps involving Mycenaeans fighting on the side of the Egyptians. Further back still, and on an alignment skew to that of the main royal buildings, is a group of large rectangular mud-brick buildings mostly of uncertain use. 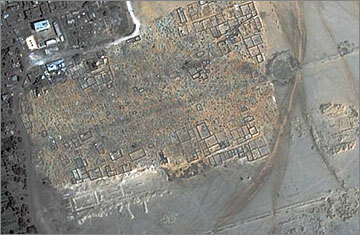 The excavators identified them as the ‘Military and Police Quarters’. 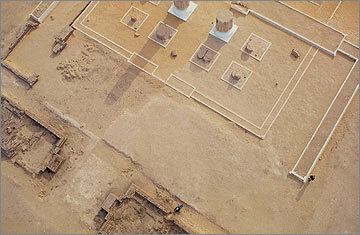 The most convincing evidence is the layout of the easternmost block (R42.10), with pylon entrance and huge central well. Facing the central court was a row of six unusually long chambers with cobbled floors, mangers and tethering-stones. 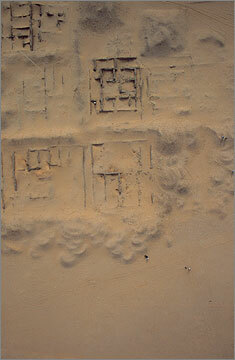 The excavators provided the further comment: ‘The streets separating the various buildings of this quarter are some 15 cm. thick with horse manure’, though in what way the deposit was determined to be specific to horses is not stated. 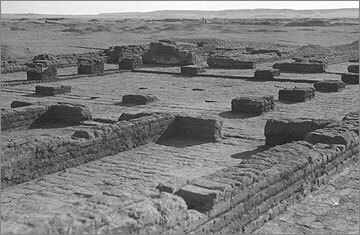 Building R42.9 of the ‘Military and Police Quarters’, after excavation (1936), viewed towards the south-east. Across a broad space behind the temple lay an unwalled village of narrow straight streets running east-west. The houses (Clerks’ Houses in the original report) varied in width though not in depth, some having a column to support the roof of the main room. They were provided with stairs to the roof. In view of the absence of ovens and other elements known from the Workmen’s Village one might wonder if they were proper residences for families or served as offices for scribal work. Further back still were several enclosures containing wells and buildings. One (R43.1A) has the plan of a conventional house; another (R43.1B) combined storerooms with a courtyard with portico off which led a small painted throne room. A third enclosure (R43.2) housed in one corner a mud-brick building that had contained a wooden shrine for the ‘the great statue which the King caused to be made’ as well as other wooden statues. Reconstruction, by architect Ralph Lavers, of the throne room in building R43.1. 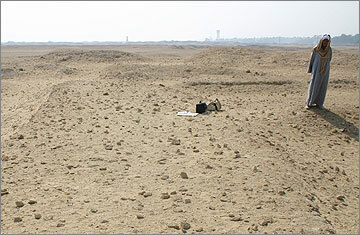 An open patch of desert between the ‘stables’ and the house of the king's statues is covered with a thick deposit of ancient debris, subdivided into two areas of concentration. The bulk of the debris consists of sherds though the southern area also contains the discarded debris from kilns. It was in these dumps that Petrie recovered ‘hundreds of pieces’ of Mycenaean pottery and numerous fragments from glass vases and faience rings. These dumps seem therefore to represent debris coming from the palace and from a separate industrial area. The Central City: did all of it make up the palace? 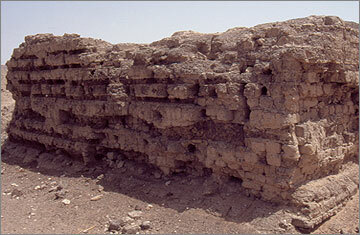 If a wall had surrounded the whole Central City – including the two Aten temples and the Great Palace – we would probably see the entire enclosure as a ‘palace’, for it housed many of the elements that equipped Akhenaten to rule. But should an enclosure wall make such a difference? 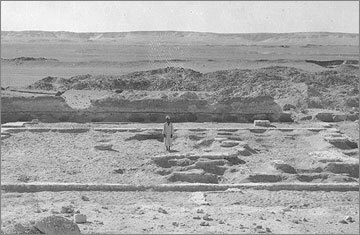 If we choose to regard a palace primarily as an institution rather than an impressive single piece of architecture, the Central City becomes, in its entirety and in its variety of scale, Akhenaten’s principal palace. The fact that it lay spread out on unwalled open ground – as did the whole city – simply tells us something of the character of his society. It might be noted that bricks stamped with ‘The Mansion’ were also used in the King’s House, in one of the blocks south of the Small Aten Temple and in one of the buildings to the east of it. Petrie, W.M.F., 1894. Tell El Amarna. London: Methuen. Pendlebury, J.D.S., 1951. 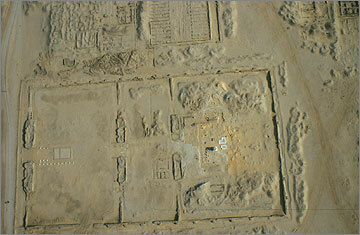 The City of Akhenaten III. London: Egypt Exploration Society. Kemp, B.J. and F. Weatherhead, 2000. 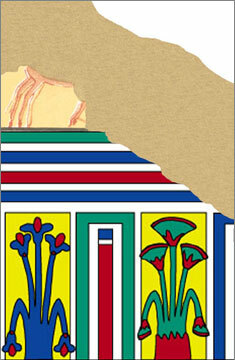 Palace decoration at Tell el-Amarna. In S. Sherratt, ed., The Wall Paintings of Thera, Proceedings of the First International Symposium 30 August–4 September 1997. Athens: Thera Foundation. Vol. I, 491–523. Weatherhead, F., 1992. 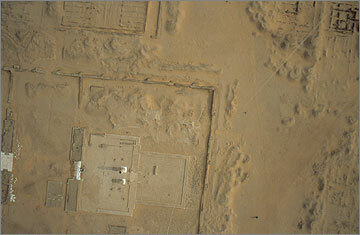 Painted Pavements in the Great Palace at Amarna. Journal of Egyptian Archaeology 78, 179–94. Weatherhead, F., 1994. Wall-paintings from the North Harim in the Great Palace at Amarna. 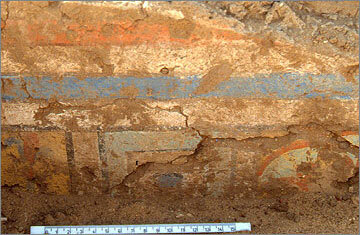 Journal of Egyptian Archaeology 80, 198–201. Weatherhead, F., 1995. Wall-paintings from the King's House at Amarna. Journal of Egyptian Archaeology 81, 95–113. Weatherhead, F., 1995. Wall paintings from the Bridge in the Central City. In B.J. 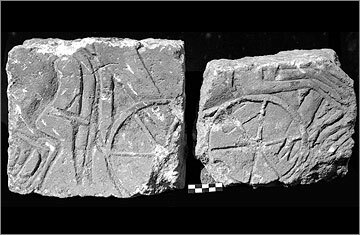 Kemp, ed., Amarna Reports VI. Occasional Publications 10. London: Egypt Exploration Society, 399–410. Traunecker, C. and F. Traunecker, 1984–5. 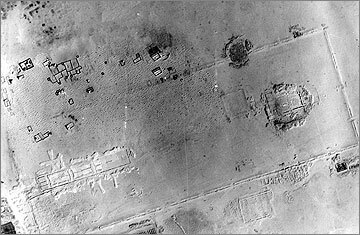 Sur la salle dite ‘du couronnement’ à Tell-el-Amarna. Bulletin. Société d’Égyptologie, Genève 9–10, 285–307.